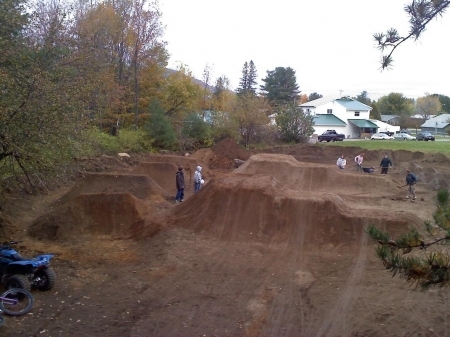 e-thirteen posted this photo on sicklines.com of the Dual Slalom Course Kyle built at Highland Mountain Bike Park. Kyle observes as Kyle Strait (right) dominates the new SRAM Dual Stunt event at the Sea Otter Classic. Course built by Kyle Ebbett and Jeff Lenosky. Jeff Lenosky along with fellow SRAM superstar, Kyle Ebbett recently coordinated with IMBA on a unique, urban trail project. The new trails are located in Highbridge Park in Manhattan. SRAM-So tell me about the Highbridge project, Jeff. Jeff- It’s a really cool project going on in Highbridge Park which is just North of the George Washington Bridge in Manhattan. Off road riding was illegal in all city parks until this project started, now they have Cross Country and Freeride trails and a cool Dirt Jump Park. SRAM-How did you get involved? Jeff- The New York City Mountain Bike Association contacted IMBA about helping them plan out the entire project. I had met one of the guys from IMBA a few years back at a contest in North Carolina. He contacted me because he knew I was fairly local and wanted some riders involved in the planning and building of the jumps. He also knew that I have been doing more and more course design so he figured I’d be a good candidate. SRAM-Who did you work with? Jeff-I worked with Judd de Vall who used to be a pro downhiller, but now works for IMBA. I also worked with Kyle Ebbett who is a pro freerider for Scott and SRAM. I’ve done some other jobs with Kyle in the past and figured I’d get him involved since he can build good jumps and drive the wheels off a Bobcat. We had a ton of volunteers on the weekends but after being there for a couple of days, we had all kinds local kids asking us if they could help. It was really cool to see how psyched the kids were to just get involved with something. They’d be out there in there baseball uniforms and cleats, digging dirt jumps. SRAM-How long did the job take? Jeff- We worked there for 10 days straight. The weather wasn’t too cooperative so it took a little longer than usual. The park is bigger than the size of a football field and we moved over 400 tons of dirt, it was a pretty busy week. The first couple of days we were stressing every time a kid would stand on a jump or disregard typical dirt jump etiquette, but as the week wore on we could see how excited the kids were, so we chilled out. Every day when school let out, there would be kids riding BMX bikes, mountain bikes, borrowing our bikes and if they didn’t have a bike, they’d literally run around the jumps on their feet. Their energy was unbelievable! I really hope the locals take care of this place and make it a killer jump spot for a long time, but either way, we made a impact on the neighborhood, and that was really cool. SRAM-When does the park open? Jeff- I’m sure kids are over there right now, but the official grand opening for the entire project is May 19th. If you live in the New York area, make sure you check it out sometime.